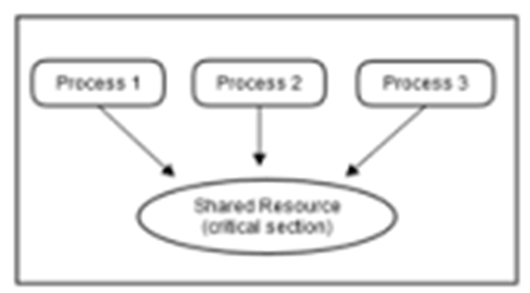 · Process synchronization refers to the idea that multiple processes are to join up or handshake at a certain point, in order to reach an agreement or commit to a certain sequence of action. 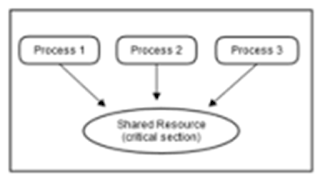 · Process Synchronization means sharing system resources by processes in such a way that, Concurrent access to shared data is handled thereby minimizing the chance of inconsistent data. A situation like this, where several processes access and manipulate the same data concurrently and the outcome of the execution depends on the particular order in which the access takes place, is called a race condition. A race condition occurs when two or more threads can access shared data and they try to change it at the same time. Because the thread scheduling algorithm can swap between threads at any time, you don’t know the order in which the threads will attempt to access the shared data. Therefore, the result of the change in data is dependent on the thread scheduling algorithm, i.e. both threads are “racing” to access/change the data. The value of count will be 4, where the correct result should be 5. The value of count could also be 6 if producer executes MOV counter, R1 at the end. The reason for this State is that we allowed both processes to manipulate the variable counter concurrently. A situation likes this, where several processes access and manipulate the same data concurrently and the outcome of the manipulation depends on the particular order in which the access takes place, is called a race condition.